A Guy Ritchie film, Lock Stock takes us into the upside down world of four regular guys whose lives take a turn for the worse when they owe 500,000 pounds when a card game is lost due to cheating. The lads have a limited amount of time to get the money back or they are up for it. Enter some inept drug dealers, some hardened thugs and a robbery gone wrong and you will start to get a handle on the storyline. This movie is sheer brilliance and the pacing superb as Ritchie delivers up a cult classic. The plot has so many twists and turns that your head will be spinning, however it's not too much to keep a handle on, and the ending quite frankly should surprise everyone. 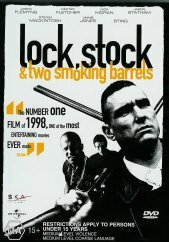 For those of you who enjoyed the movie, please be aware that there is a spin off series called Lock Stock on DVD that should keep you extremely happy. The movie looks great, although somewhat grainy (intentionally). The extras are not in abundance which is unfortunate, with them only being interviews and trailers. The movie sounds great and don't be alarmed that there is no sound on the animated menu as that also is intentional for some reason that absolutely eludes me. This is a must own DVD for fans of Pommy Underworld flicks or just people who like clever movies.